At baselworld this year, Japanese watchmaker Seiko took the opportunity to celebrate its long career in producing professional dive watches. While its first dive watch, the self-winding 150M Diver’s, was released in 1965, Seiko knew it was too shallow for professional divers. 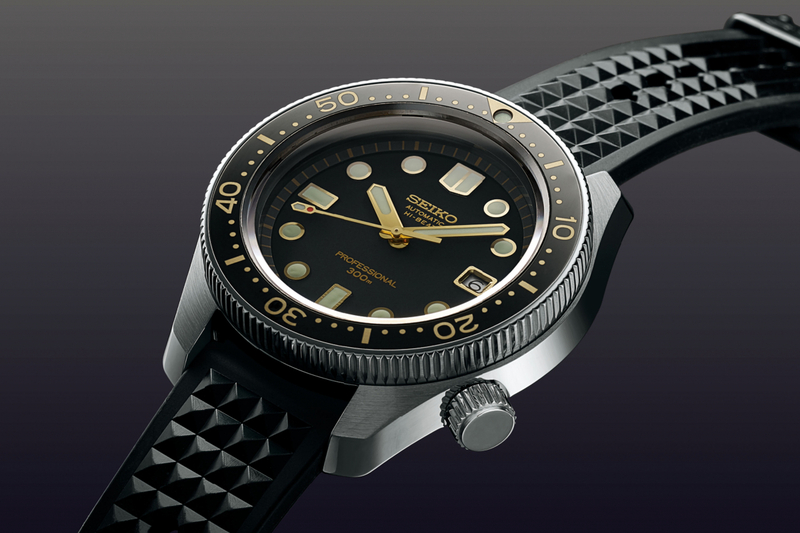 After three additional years of research and development, Seiko managed to raise the bar, doubling the depth in 1968. Seiko’s engineers were able to create a watch that not only had a 300-metre water resistance, but also boasted a 10-beat high precision automatic calibre, a one-piece structure, screw-down protection crown and unidirectional rotating bezel. This year, Seiko celebrates that 1968 timepiece with a tribute piece named the Seiko 1968 Automatic Diver’s Re-creation Limited Edition SLA025. While the original timepiece may have been created for air diving, this new piece was made specifically for saturation diving. It incorporates many of the original elements such as the one-piece case construction and the flat case back. Its movement has been updated of course. The SLA025 sees the Calibre 8L55, an automatic 10-beat movement with 55 hours of power reserve. The watch’s case is a thing of beauty, as with most Seiko timepieces, with Zaratsu polishing on the lugs as well as a dual curved sapphire crystal to ensure high legibility even in the watery depths. Seiko went as far as to have the indices at 12, six and nine designed differently to ensure that time is read without error at 300 metres in. If you’re looking forward rather than back, Seiko also announced the launch of its newest Prospex Tuna Solar Diver. The SNE498 from Baselworld this year sees a solar powered quartz movement, meaning that if you’re out the whole weekend diving out in the sun, you’d never have to worry about timing being off. Seiko even promises a 10-month long power reserve once the watch is fully charged under the sun. At 47mm, the watch is a stand-out on the wrist and perfect for both the desk-diving gent and the one who’s heading into the waters. With a water resistance of up to 200 meters (660 feet), the watch meets ISO standards for scuba diving.